I made this card and thought what a neat friendship type card. I captioned it with this stamp "God has blessed me with your friendship." I just love that. I think this is something special because friendship is very valuable. We need to care about our friends and their feelings because you never know when you may need them to comfort you in a situation. Always take things from friends seriously. I cherish many of my friends. I thank God for each and everyone of you. 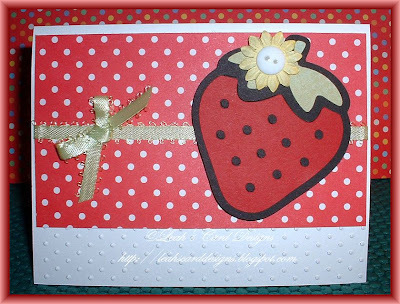 Thank you for stopping by to take a look at my card. Feel free to post a comment. I love to read them. You make me smile with your comments. Thank you so much!!! Have a great evening everyone. Those in snow country stay warm! Enjoy a nice cup of Hot Chocolate!